Welcome to week three of our Walking in Agape Love series. If you are just now finding this series, please be sure to go back through my other posts. Also check out the how this series began by reading my contributor's post, When Love Isn't Easy, over at Worshipful Living. Today we are looking at the beauty of Love that we see in the next five characteristics of Agape Love. Rejoice in the truth that is seen in the lives of others. Choose to focus on the positive qualities of others rather than on the negative like we discussed last week. Build up others with the words you speak about them. Encourage them in the grace of God when they struggle with living life to the glory of God. This is the beauty of Love. To bear all things means to hide or conceal the faults and imperfections of others. It's a willingness to bear with them patiently and privately - not making their faults and imperfections public knowledge. This also is the beauty of Love. Agape Love chooses to believe good things about other people instead of criticizing them or jumping to conclusions about them. It extends the benefit of the doubt to them. In this, we see the beauty of Love. Hope is defined as a feeling of expectation and desire for a certain thing to happen. Maintaining hope for another person when they fail you is another beautiful characteristic of Agape Love. It doesn't write off that person, but maintains hope that the relationship can be healed and continued. Love holds on to hope. This hope is extended to all things - words and actions - of others in our lives. What better way to display the beauty of Love! Endure is defined as suffer patiently something painful or difficult. Agape Love patiently endures times of hardship in relationships - even the "seventy times seven" offenses (Luke 17:4). Oh, the beauty of Love that is displayed when we choose to endure! 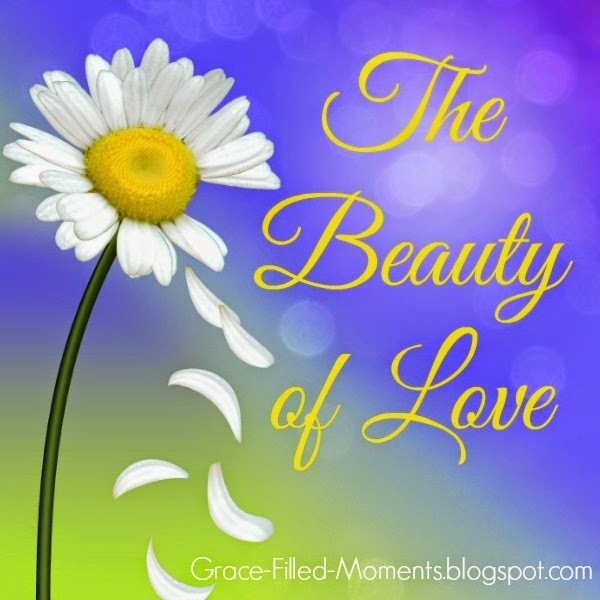 The beauty of love - Agape Love - is so different from the world's idea of what love is. 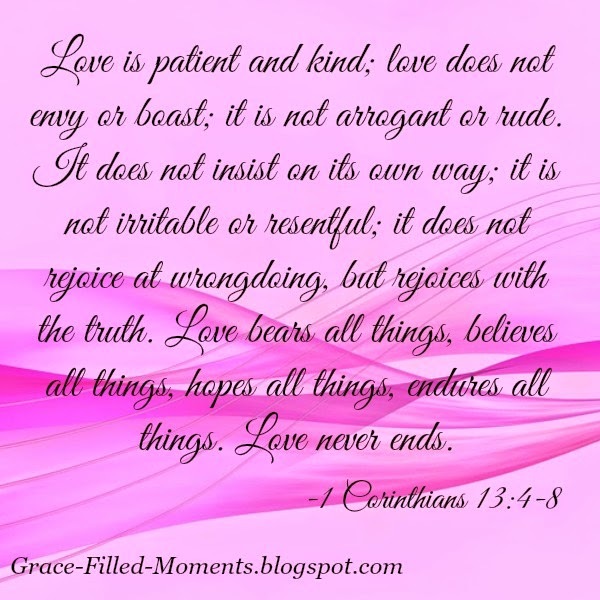 1 Corinthians 13:4-8 gives us the truth of what love really is. The Agape Love of God covers all things in these four ways we've just discussed (bears, believes, hopes and endures). It isn't quick to write off relationships that go through hard times. Do you see the progression - bears up under the hurt, believes the best about the person, hopes for better times in the relationship, and endures patiently through the hard times to get back to the desired outcome for the relationship. Let's remember that God loves us with Agape Love, and so we should extend this Agape Love to others in our lives. Let's strive to build all of our relationships on the true Agape Love of God, as we seek to live life's moments in the power of God's grace that is alive and active in our hearts. 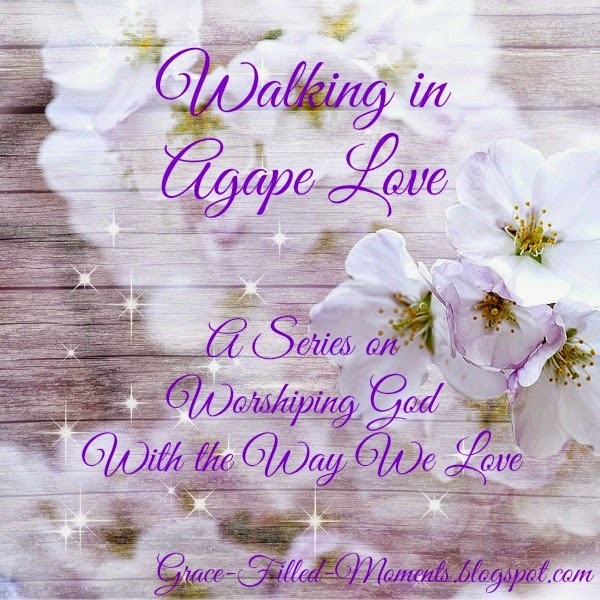 Please join me next Sunday as I share my final post to close out this series on Walking in Agape Love. Thank you so much for joining me each week!